Have you ever wondered where Google gets its data for your local business? Here’s what you need to know. When you upload your business information to Acxiom you must have the following information available. Please enter the Business information to be added to Acxiom database. BE SURE TO HAVE ALL DOCUMENTATION READY TO UPLOAD OR FAX when you submit your business information. NOTE: You will need the following documentation to validate your business. We do not accept documents obtained or scanned from Internet sites or W-9 Forms. This documentation must be submitted with account information or your listing will be denied and you will have to reenter the information and resubmit. Google Comments Off on Where Does Google Get Its Data For Your Business Page? 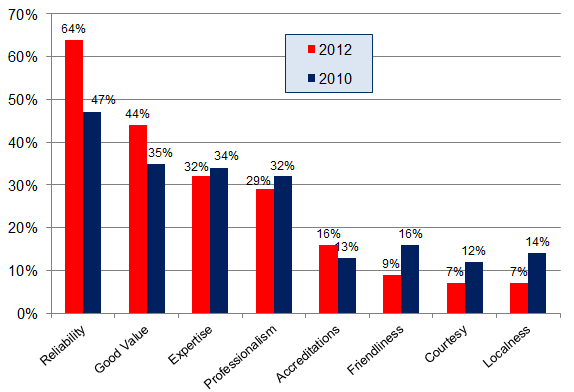 Part 2 of the Local Consumer Review Study 2112 by Search Engine Land just came out and here’s the take-away. 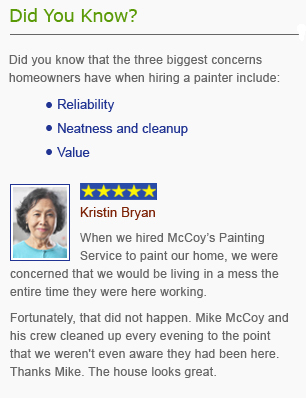 When customers write about how reliable your business is, readers sit-up and take notice. When they write about how friendly and courteous you are, they yawn! Reliability is your ticket to building your business through customer reviews. I don’t think this comes as a surprise to anyone, but what is surprising is that so few business owners are taking advantage of this information. Prospects who read customer reviews that answer their concerns are much more likely to initiate contact with a company than if they read reviews that address how likeable and attentive the employees are. Likeability and attention are critical, and the lack of likeability and attention are the biggest reason people complain. But they’re not the reason people buy. As a business owner you want to do everything in your power to encourage your happy customers to write reviews that address reliability and other customer concerns. The Five Star Review System takes care of this automatically, so please take advantage of this feature. When a customer is asked to write a review using the Five Star Review System, they’re taken to a page that subtly coaches them on how to write a meaningful review. The reason for this is two fold. First, if left to their own devices, they will write a review about how wonderful you are … thinking that is the kind of review you want. Second, when you provide simple and subtle guidance, they will write a much more meaningful review and appreciate the help. When customers get to the page on the Five Star Review System where they’re asked to write their review, they will see two pieces of information.. The first thing they see is text that reads. By offering this information to soon-to-be reviewers, it gives them guidance as to what you REALLY want them to write about. Business owners who use the system can add any three concerns they choose … and it’s different for every industry, but remember that Reliability rules. The second thing they see are examples of three very well written reviews that address one or more of these concerns. By providing this information, reviewers can quickly see what you’re expecting of them, and they’ll appreciate the help. Choose reviews that talk about how reliable you are. If you’re not using the Five Star Review System, let me encourage you to create a page on your website or add this information to the email you send when asking customers to write a review for your business and notice how much better and more persuasive your reviews become. Does your local business have a mobile web presence? It should. Check out this wonderful Mobile Website Template that allows you to easily create and direct people to your mobile website rather than your primary website when they search for you using a mobile device. Did you know that on Valentine’s Day, 2012, 62% of all US based national chain restaurant queries on Google were made from a mobile device? Here’s what that tells me. If you have a local business, you must have the ability for your customers to easily find your business on their mobile device and provide them with a Click To Call button. We include a mobile website with a click to call button on every website we build, and you should too. This trend is only going up. What are you doing about it? If you want to read more about mobile searches, check out this article from Google.